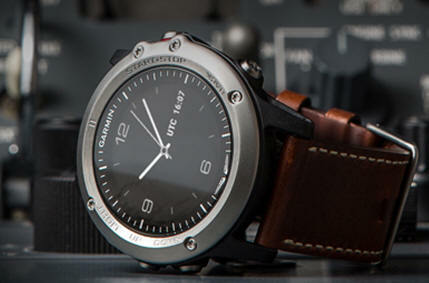 June 18, 2015 - Garmin on Tuesday introduced D2 Bravo, a next-generation aviator watch that combines practical functionality and sophisticated design to bring pilots and aviation enthusiasts a premium GPS watch. D2 Bravo incorporates Garmin’s signature direct-to and nearest airport navigation features, complete with a worldwide aviation navigation database. New and exclusive benefits such as altitude alerts, including preset alerts for altitudes requiring supplemental oxygen, as well as easy access to current aviation weather information, set D2 Bravo apart from other pilot watches on the market. In addition to in-flight functionality, D2 Bravo incorporates versatile activity tracking features and multi-sport functions while supporting Smartphone connectivity. With uncompromising details such as a stainless steel bezel and domed sapphire lens, D2 Bravo combines GPS and wearable technology that Garmin is known for with a sophisticated new form factor suitable for pilots and aviation enthusiasts alike. Innovative features within D2 Bravo go further to provide imperative alerts and beneficial weather information. When paired with a compatible smartphone, aviation routine weather reports (METARs) are displayed on the face of D2 Bravo in plain language and are color-coded to indicate visual or instrument meteorological conditions (IMC), giving pilots convenient access to the most up-to-date weather information at a glance. Valuable in pressurized cabins as a back-up cabin pressure monitor and within unpressurized aircraft as a helpful reminder to use oxygen, D2 Bravo uses the built-in altimeter to provide preset altitude alerts, which remind pilots when to use supplemental oxygen at critical altitudes where oxygen may be required. D2 Bravo provides vibrating alerts in 30-minute intervals to notify the pilot when cabin pressure is at or above 12,500 feet. Pilots can navigate with confidence using D2 Bravo, which offers a built-in GPS, highly accurate altimeter with an adjustable barometric setting, compass with an HSI and moving map display. Simultaneous display of date and Zulu/UTC time provides pilots with an at a glance view of important information on the analog face of D2 Bravo. Information such as speed, altitude and time enroute are recorded and stored for each flight, so pilots can easily reference recent flight information all within the watch. D2 Bravo also provides altitude alerting to notify pilots when they reach or leave a preselected altitude, helping to ensure the desired altitude is maintained in-flight. Additionally, D2 Bravo features the option to set up vibrating alerts as a reminder to perform time-sensitive operations such as switching fuel tanks while in-flight. Smartphone connectivity is available with D2 Bravo, allowing customers to receive email, text, weather and additional notifications, such as alerts from Garmin Pilot™. This full-featured aviation application available for iOS and Android operating systems, provides pilots with a comprehensive worldwide navigation database. D2 Bravo also supports hundreds of additional applications available through Garmin Connect. D2 Bravo is expected to be available in July and has a suggested retail price of $699.